KUDOS HYNC-1319 Easy to use. KUDOS HYNC-1319 Seven models of nut splitter to choose from. KUDOS HYNC-1319 Unique angled head design for a variety of applications. KUDOS HYNC-1319 Single action cylinder with hydraulic advance with spring-return. KUDOS HYNC-1319 Operated by hydraulic pump with rated oil pressure of 700 bar(10,000psi). KUDOS HYNC-1319 Hex Wench 2.5 & 4 mm. KUDOS HYNC-1319 Spare Chisels No. KUDOS HYNC-1319 Caution: Only suitable for ≤ grade 8 nuts, splitting of stainless, square, and / or star nuts are prohibited. KUDOS HYNC-1319 Nut hardness must not exceed HRc-44. KUDOS HYNC-1924 Easy to use. KUDOS HYNC-1924 Seven models of nut splitter to choose from. KUDOS HYNC-1924 Unique angled head design for a variety of applications. KUDOS HYNC-1924 Single action cylinder with hydraulic advance with spring-return. KUDOS HYNC-1924 Operated by hydraulic pump with rated oil pressure of 700 bar(10,000psi). KUDOS HYNC-19249 Hex Wench 3 & 5 mm. KUDOS HYNY-1924 Caution: Only suitable for ≤ grade 8 nuts, splitting of stainless, square, and / or star nuts are prohibited. KUDOS HYNC-1924 Nut hardness must not exceed HRc-44. KUDOS HYNC-2432 Easy to use. KUDOS HYNC-2432 Seven models of nut splitter to choose from. KUDOS HYNC-2432 Unique angled head design for a variety of applications. KUDOS HYNC-2432 Single action cylinder with hydraulic advance with spring-return. KUDOS HYNC-2432 Operated by hydraulic pump with rated oil pressure of 700 bar(10,000psi). KUDOS HYNC-2432 Hex Wench 3 & 5 mm. KUDOS HYNC-2432 Spare Chisels No. KUDOS HYNY-2432 Caution: Only suitable for ≤ grade 8 nuts, splitting of stainless, square, and / or star nuts are prohibited. KUDOS HYNC-2432 Nut hardness must not exceed HRc-44. 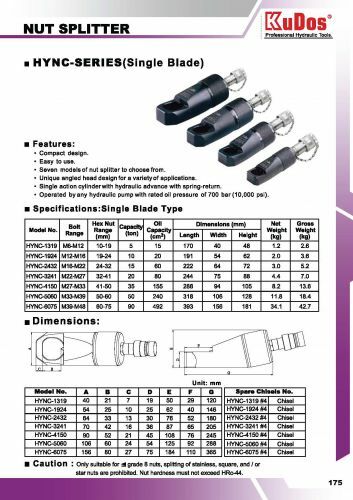 KUDOS USA NUT SPLITTER SINGLE BLADE HYNC-3241.pdf. KUDOS HYNC-3241 Easy to use. KUDOS HYNC-3241 Seven models of nut splitter to choose from. KUDOS HYNC-3241 Unique angled head design for a variety of applications. KUDOS HYNC-3241 Single action cylinder with hydraulic advance with spring-return. KUDOS HYNC-3241 Operated by hydraulic pump with rated oil pressure of 700 bar(10,000psi). KUDOS HYNC-3241 Hex Wench 4 & 6 mm. KUDOS HYNC-3241 Spare Chisels No. KUDOS HYNY-3241 Caution: Only suitable for ≤ grade 8 nuts, splitting of stainless, square, and / or star nuts are prohibited. KUDOS HYNC-3241 Nut hardness must not exceed HRc-44. KUDOS HYNC-4150 Easy to use. KUDOS HYNC-4150 Seven models of nut splitter to choose from. KUDOS HYNC-4150 Unique angled head design for a variety of applications. KUDOS HYNC-4150 Single action cylinder with hydraulic advance with spring-return. KUDOS HYNC-4150 Operated by hydraulic pump with rated oil pressure of 700 bar(10,000psi). KUDOS HYNC-4150 Hex Wench 4 & 6 mm. KUDOS HYNC-4150 Spare Chisels No. KUDOS HYNY-4150 Caution: Only suitable for ≤ grade 8 nuts, splitting of stainless, square, and / or star nuts are prohibited. KUDOS HYNC-4150 Nut hardness must not exceed HRc-44. KUDOS HYNC-5060 Easy to use. KUDOS HYNC-5060 Seven models of nut splitter to choose from. KUDOS HYNC-5060 Unique angled head design for a variety of applications. KUDOS HYNC-5060 Single action cylinder with hydraulic advance with spring-return. KUDOS HYNC-5060 Operated by hydraulic pump with rated oil pressure of 700 bar(10,000psi). KUDOS HYNC-5060 Hex Wench 5 & 6 mm. KUDOS HYNC-5060 Spare Chisels No. KUDOS HYNY-5060 Caution: Only suitable for ≤ grade 8 nuts, splitting of stainless, square, and / or star nuts are prohibited. KUDOS HYNC-5060 Nut hardness must not exceed HRc-44. KUDOS HYNC-6075 Easy to use. KUDOS HYNC-6075 Unique angled head design for a variety of applications. KUDOS HYNC-6075 Single action cylinder with hydraulic advance with spring-return. KUDOS HYNC-6075 Operated by hydraulic pump with rated oil pressure of 700 bar(10,000psi). KUDOS HYNC-6075 Hex Wench 5 & 6 mm. KUDOS HYNC-6075 Spare Chisels No. KUDOS HYNY-6075 Caution: Only suitable for ≤ grade 8 nuts, splitting of stainless, square, and / or star nuts are prohibited. KUDOS HYNC-6075 Nut hardness must not exceed HRc-44. KUDOS HYNC-1319D Easy to use. KUDOS HYNC-1319D Seven models of nut splitter to choose from. KUDOS HYNC-1319D Unique angled head design for a variety of applications. KUDOS HYNC-1319D Single action cylinder with hydraulic advance with spring-return. KUDOS HYNC-1319D Operated by hydraulic pump with rated oil pressure of 700 bar(10,000psi). KUDOS HYNC-1319D Hex Wench 2.5 & 4 mm. KUDOS HYNC-1319D Spare Chisels No. KUDOS HYNC-1319D Caution: Only suitable for ≤ grade 8 nuts, splitting of stainless, square, and / or star nuts are prohibited. KUDOS HYNC-1319D Nut hardness must not exceed HRc-44. KUDOS HYNC-1924D Easy to use. KUDOS HYNC-1924D Seven models of nut splitter to choose from. KUDOS HYNC-1924D Unique angled head design for a variety of applications. KUDOS HYNC-1924D Single action cylinder with hydraulic advance with spring-return. KUDOS HYNC-1924D Operated by hydraulic pump with rated oil pressure of 700 bar(10,000psi). KUDOS HYNC-1924D Hex Wench 3 & 5 mm. KUDOS HYNC-1924D Spare Chisels No. KUDOS HYNC-1924D Caution: Only suitable for ≤ grade 8 nuts, splitting of stainless, square, and / or star nuts are prohibited. KUDOS HYNC-1924D Nut hardness must not exceed HRc-44. KUDOS HYNC-2432D Easy to use. KUDOS HYNC-2432D Seven models of nut splitter to choose from. KUDOS HYNC-2432D Unique angled head design for a variety of applications. KUDOS HYNC-2432D Single action cylinder with hydraulic advance with spring-return. KUDOS HYNC-2432D Operated by hydraulic pump with rated oil pressure of 700 bar(10,000psi). 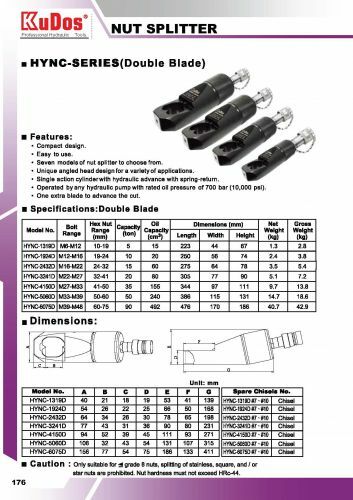 KUDOS HYNC-2432D Hex Wench 4 & 6 mm. KUDOS HYNC-2432D Spare Chisels No. KUDOS HYNC-2432D Caution: Only suitable for ≤ grade 8 nuts, splitting of stainless, square, and / or star nuts are prohibited. KUDOS HYNC-2432D Nut hardness must not exceed HRc-44. KUDOS HYNC-3241D Easy to use. KUDOS HYNC-3241D Seven models of nut splitter to choose from. KUDOS HYNC-3241D Unique angled head design for a variety of applications. KUDOS HYNC-3241D Single action cylinder with hydraulic advance with spring-return. KUDOS HYNC-3241D Operated by hydraulic pump with rated oil pressure of 700 bar(10,000psi). KUDOS HYNC-3241D Hex Wench 4 & 6 mm. KUDOS HYNC-3241D Spare Chisels No. KUDOS HYNC-3241D Caution: Only suitable for ≤ grade 8 nuts, splitting of stainless, square, and / or star nuts are prohibited. KUDOS HYNC-3241D Nut hardness must not exceed HRc-44. KUDOS HYNC-4150D Easy to use. KUDOS HYNC-4150D Seven models of nut splitter to choose from. KUDOS HYNC-4150D Unique angled head design for a variety of applications. KUDOS HYNC-4150D Single action cylinder with hydraulic advance with spring-return. KUDOS HYNC-4150D Operated by hydraulic pump with rated oil pressure of 700 bar(10,000psi). KUDOS HYNC-4150D Hex Wench 4 & 6 mm. KUDOS HYNC-4150D Spare Chisels No. KUDOS HYNC-4150D Caution: Only suitable for ≤ grade 8 nuts, splitting of stainless, square, and / or star nuts are prohibited. KUDOS HYNC-4150D Nut hardness must not exceed HRc-44. KUDOS HYNC-5060D Easy to use. KUDOS HYNC-5060D Seven models of nut splitter to choose from. KUDOS HYNC-5060D Unique angled head design for a variety of applications. KUDOS HYNC-5060D Single action cylinder with hydraulic advance with spring-return. KUDOS HYNC-5060D Operated by hydraulic pump with rated oil pressure of 700 bar(10,000psi). KUDOS HYNC-5060D Hex Wench 5 & 6 mm. KUDOS HYNC-5060D Spare Chisels No. KUDOS HYNC-5060D Caution: Only suitable for ≤ grade 8 nuts, splitting of stainless, square, and / or star nuts are prohibited. KUDOS HYNC-5060D Nut hardness must not exceed HRc-44. KUDOS HYNC-6075D Easy to use. KUDOS HYNC-6075D Seven models of nut splitter to choose from. KUDOS HYNC-6075D Unique angled head design for a variety of applications. KUDOS HYNC-6075D Single action cylinder with hydraulic advance with spring-return. KUDOS HYNC-6075D Operated by hydraulic pump with rated oil pressure of 700 bar(10,000psi). KUDOS HYNC-6075D Hex Wench 5 & 6 mm. KUDOS HYNC-6075D Spare Chisels No. KUDOS HYNC-6075D Caution: Only suitable for ≤ grade 8 nuts, splitting of stainless, square, and / or star nuts are prohibited. KUDOS HYNC-6075D Nut hardness must not exceed HRc-44. KUDOS & ENERPAC NC-1319 Nut splitters include spare chisel, spare set screw and wrench used to secure the chisel. A CR-400 coupler is standard. KUDOS & ENERPAC NC-1319 Ordering Notes: Maximum allowable hardness to split is HRc-44. Not to be used on square nuts.